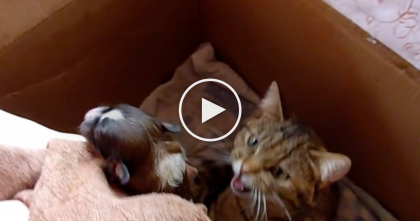 Owners Get VERY Unexpected Reaction When They Give This Cat A Shower… LOL, Just Watch!! Most cats freak out with loud running water, but although this video doesn’t have sound, you won’t believe the reaction of this cat when he steps into the shower with his adorable green cap on! Almost instantly, the results are just unbelievable – the cat isn’t moving much, isn’t running for the door… In fact this cat seems to be just as happy as any normal cat! I’ve NEVER seen a cat act so chill while in the shower—SHARE this video with your friends and family! Watch: He’s About To Brush His Own Teeth, But When Kitty Hears The Noise, He Just Can’t Resist!